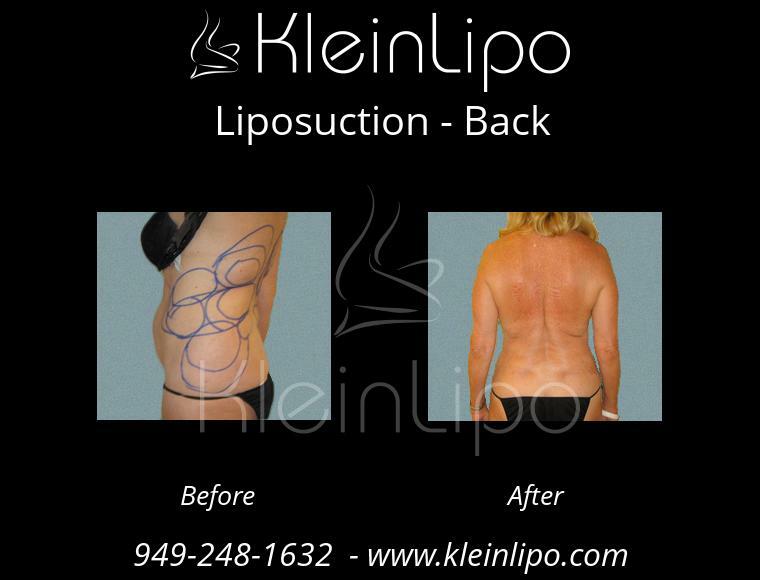 Female back liposuction procedures performed in our Newport Beach Liposuction Surgery Center using the tumescent liposuction technique invented by Dr. Klein provides excellent cosmetic results. 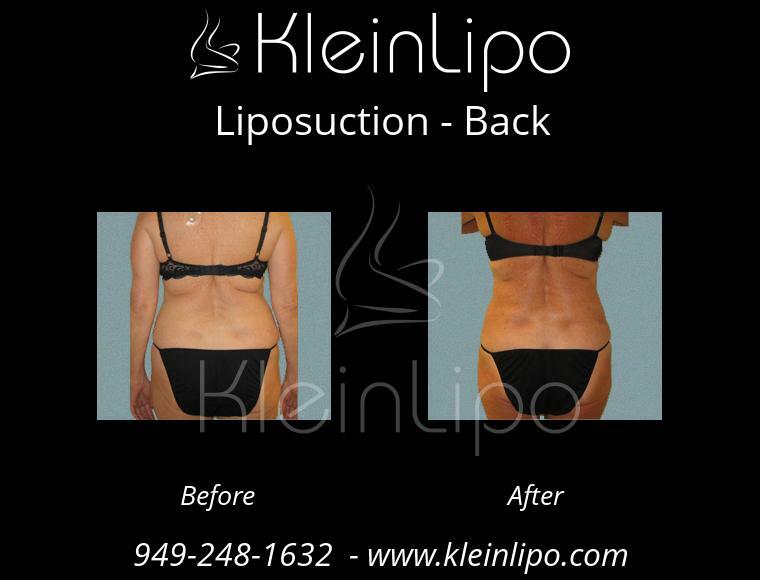 Liposuction of the female back can produce dramatic improvements as shown in these before and after pictures of our patients. Infra-scapular back is the area on the back just below bra. The fat in this area is a single subcutaneous layer, without a well-defined deeper fat compartment. When a tight bra is worn, this area tends to bulge-out more prominently. Some women have an inherited tendency to collect fat in the infra-scapular back area. With increasing degrees of obesity the infra-scapular back can accumulate so much fat that the skin and subcutaneous tissue can bunch-up forming parallel rolls of fat. Tumescent liposuction with microcannulas can remove this unsightly localized “bra-fat” and provide dramatic aesthetic improvement. Infra-scapular back fat is fibrous. Fatty tissue contains fat cells and fibrous connective tissue that hold the fat cells in place. The fat on the infra-scapular back seems to contain a higher proportion fibrous tissue than the fat in other areas of the body. The highly fibrous nature of fat in the subscapular area makes liposuction a challenge. This densely fibrous tissue is nearly impossible to penetrate with large cannulas. However, with the use of microcannulas and tumescent infiltration, this area can be successfully treated. The greater the fibrous content of a fat compartment, the greater the resistance to the penetration by a cannula, and the more difficult it is to achieve a satisfactory degree of liposuction. The initial use of smaller microcannulas, followed by gradually using larger microcannulas, permits more thorough liposuction. Microcannulas with an inside diameter between 1.2 mm and 2.2 mm, can penetrate this fat more easily and permit improved cosmetic results. With weight loss by dieting, the fat cells become smaller but the fibrous tissue remains. Thus after a large weight loss, the remaining compartment of fat will be relatively more fibrous. Consequently, when treating patients with rolls of fat on the back, liposuction is relatively easy if the patient is near her maximum all-time weight. For another patient of the same height and weight who has lost a considerable degree of weight, liposuction of the same area is much more difficult. For mildly obese patients who do not have excessively fat back, liposuction can also provide significant improvement. If a patient gains a significant amount of weight after liposuction of the back, then some of the cosmetic benefit of liposuction may be lost. The skin on the back is especially susceptible to liposuction-induced hyperpigmentation of the skin surrounding incision sites. The number of incisions placed on the back should be minimized. Trauma to the skin near an incision site can result in a dark mark known as post-inflammatory hyperpigmentation. Microcannulas are better than larger cannulas for avoiding unnecessary trauma to the skin near incision sites on the back. Also, hyperpigmentation at incision sites for liposuction seems more likely to occur on the back than do incisions located more laterally toward the sides. 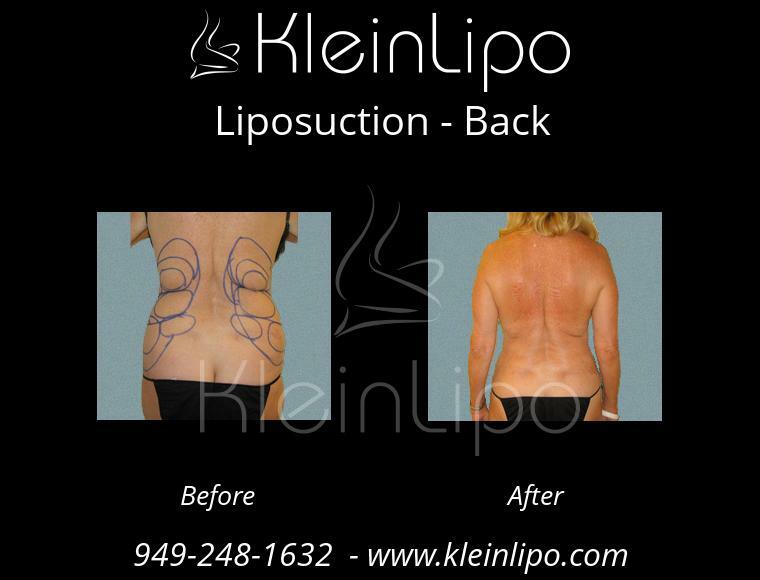 Thus, when doing liposuction on the back, surgeons will often place incisions sites as far laterally as is practical. Because there is no deep compartment of fat on the back, but merely a thick layer of dermal fat, some surgeons have a tendency to do excessive superficial liposuction and injure the skin. The consequence of excessive liposuction that injures the under-surface of the skin is a permanent discoloration of the skin known as erythema ab liporaspiration. See figure 10. An injury to the skin caused by overly aggressive liposuction can also cause full thickness necrosis of the skin (the skin dies) that ultimately results in an ugly scar. Postoperative care after liposuction of the back merely requires adequate coverage with super-absorbent pads, held in place with an appropriate torso compression garment. A high degree of external compression is not necessary for liposuction of the back. The motion of the torso during respiration, and other normal daily activities are sufficient to completely expel the residual blood-tinged anesthetic solution from treated areas overlying the rib cage. The application of absorptive compression sponges is accomplished in a fashion quite similar to applying absorptive compression sponges to the abdomen, or breasts. The relatively small fat deposits on the lower back are easily removed by liposuction. Caution should be used in the preoperative physical exam of this area. A focal lipoma or hairy birth mark may indicate the presence of a defect in the lower spine. If in doubt, an x-ray of the area should be obtained. Increasing obesity, is often associated with an increasingly prominent accumulation of fatty tissue on the mid upper back. This area is known as the Cervico-Dorsal Hump or the Buffalo Hump. Liposuction of the dorsal hump is easily accomplished and patients are uniformly delighted with the results. Posterior waist usually contains a significant fat deposit, however, it is often overlooked when the hips are treated by liposuction. Although some surgeons use ultrasonic assisted liposuction to treat the back, it is now recognized that many of the original claims about the safety of ultrasonic were not correct. The heat generated by ultrasonic liposuction device may burn the skin and cause scars. Ultrasound machines that surgeons use to perform UAL have never been approved by the United States Food and Drug Administration (FDA) for use in doing liposuction. Tumescent liposuction using microcannulas is far safer than UAL.